Gaithersburg, Maryland. I was born and raised in what is technically the South, though those living inside the Beltway often forget that little fact. Believe it or not, I was saying, “Howdy y’all,” even before I made it down to Texas. I earned my BA in English at the University of Maryland at College Park where undergraduates are often found rubbing Testudo’s golden beak before exams. Others also give a rub for the promise of good luck. I fondly remember playing ultimate on the mall, speaking Hebrew in St. Mary’s Hall, and watching NCAA basketball games at Cole Field House. Go Terps! I earned my MA and Ph.D. in English at the University of Texas at Austin. I spent 7 years in the city that is not only the state capital, but also the “live music capital of the world.” As a graduate student there, I appreciated the fact that you could go out and hear great bands for less than most people pay to see a movie. The BBQ wasn’t bad either. From there I moved to Albany, NY back on the East Coast, where I learned to appreciate the warmth of a good down coat and mastered the art of snow-shoveling! Now that I’m here in Lexington, I’m happy to return to bike-commuting. If you hear the honk of Gertrude-the-turtle-horn, you’ll know it’s me. I studied Hebrew for four years at the University of Maryland, and even lived in a special apartment for Hebrew speakers. I lived in Jerusalem, Israel in 2000-2001 and took over 400 hours of Hebrew language classes there. I now speak fluently, and returned to the Israel/PA region this year, and this time I worked on my Arabic and Hebrew. I also studied French for four years in junior high and high school, but often when I try to speak it, Hebrew comes out instead. Now I’m working on recovering my French and learning Arabic, shwaya, shwaya (slowly, slowly) as they say. Although I find there are few things as humbling as a foreign language placement exam, learning language is good for your brain! I’ve lived in Gaithersburg, Maryland; Jerusalem, Israel; Tel Aviv, Israel; Austin, Texas; Waltham, MA; Albany, New York; and now Lexington, KY. I have traveled through most of the US and Israel, parts of Spain, France, Great Britain, Scotland, Italy, the Netherlands, Austria, Switzerland, the Czech Republic, Germany, Turkey, Greece, Jordan, Egypt, Mexico, Canada, Argentina, Chile, Honduras, and Palestine. Where did I learn to dance? Although I took my first ballroom lessons around the age of 13, most of the dancing you’re likely to see me doing, I learned in Austin–when in Texas, do as the Texans. I love my cowboy boots and country music, but I find the rhythm of salsa more intoxicating than two-step. After nearly 14 years and many free lessons in local bars, I now can follow leads for both. I’ve dabbled with Egyptian style belly-dance, and I fell in love with Tango in Buenos Aires. In Albany I was lucky enough to study with the Albany Tango Society from time to time. Music and dance are food for my soul. To get my weekly nutritional requirements,I used to shake it at Pinto ‘n’ Hobbs, Ballingers, the Capital Region Salsa Socials, or the occasional Milonga. While there are a few dancing nooks and crannies in the Bluegrass, my colleague Ribhu Kaul (professor of physics at UK) and I found we were both missing the regular Latin Dancing communities we had been part of before moving to Lexington. To remedy the situation, last year we created Caliente Salsa Nights to help build and grow the local Latin Dancing Community, and Caliente Salsa Lexington, a Facebook group, to help us promote and organize our Tues. night Latin Dancing Socials at the Nicaraguan Latin Grill (1205 Versailles Rd). With a one-drink purchase, attendees receive a free lesson from 8:30-9:00 PM, with open dancing from 9:00-11:30. Hands-down, chocolate. I enjoy it most when it is of the dark, 70% or more cocoa, and dairy-free variety. Breakfast tacos and caramel nut apples are a close second. Frank was my charming little leopard gecko. He kept me company when I was up late reading, since he was nocturnal and I often pretend to be. Sadly, Frank left me in the Summer of 2006 to take up residence in the world beyond where geckos can eat as many crickets as they want. I miss his presence dearly, and express my homage to my dearly departed reptilian friend, and this post stands in memorium. 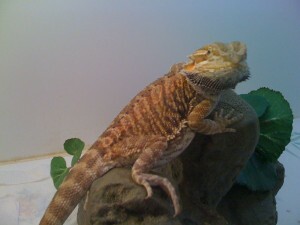 In the summer of 2010, my partner and I adopted two beautiful bearded dragons, Salsa and Electra! They love to lounge, eat crickets, munch gourmet worms, and keep me company while I write. Electra is 5 years old and one big lazy lizard. Her favorite way to eat her greens is from my hand, while perched on her log. She recently survived a major surgery, and we feel more blessed by each additional day we get to spend with her. Salsa is now a full grown beardie at the ripe age of 2.5. Though she is only 2/3 the size of Electra, she clearly doesn’t let that deter her from her pursuit of dominance! We love our leeeeezardz!!! This is Salsa, perching on her favorite log. Salsa is smaller than Electra, though you’d never know it from her actions! 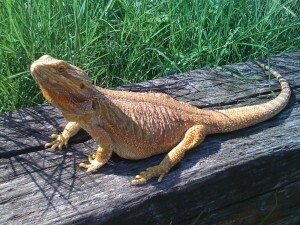 Our big bearded dragon, Electra, basking in the garden.